To say that Van Morrison is a pioneer of “mystic soul” music is inaccurate. There has been no other songwriter like him who has ventured into the unconscious as deeply and come up with pure gold. Even Van himself —as the years have gone by—has seemed to identify himself more with the simplistic earthiness of the blues, perhaps to dissociate himself from the one pop song that most on the street if interviewed would recognize: “Brown-Eyed Girl.” Even the raunchy and primitive “Gloria” that pre-dated the later mega hit has fallen into oblivion. In October 2011, Morrison was interviewed for The Telegraph about why there has been a huge wave of renewed interest in Astral Weeks that has partially prompted his recent live performances of the work. But the deeper reason seems to be the artist’s feeling compelled to re-explore just what happened during those three sessions of uncanny and profound inspiration. 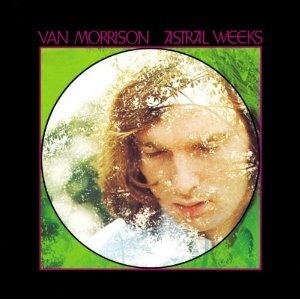 Astral Weeks is the second solo album by Northern Irish singer-songwriter Van Morrison, released in November 1968 on Warner Bros. Records. It was Morrison’s first album after Warner Bros. had been able to free him from his contract with Bang Records. The recording sessions were set up by the production-management team of Lewis Merenstein and Bob Schwaid and took place during three sessions in September and October 1968. Blending a mixture of folk, blues, jazz, and classical music, Astral Weeks received critical acclaim immediately upon its first release and subsequently has been placed on numerous widely circulated lists of best albums of all time. The 1995 Mojo list of the 100 Best Albums ranked it as number two, and it ranked nineteenth on Rolling Stone magazine’s list of the 500 Greatest Albums of All Time in 2003. It became and remains a cult favourite, despite the fact that it failed to achieve significant mainstream sales success for decades; after 33 years, it finally achieved gold in 2001.